Cognitive ability, critical reasoning, common sense. Whatever you call it, the power of your mental abilities makes a real difference to performance and potential at work. What is an ability test? Ability tests or aptitude tests are standardised methods of assessing an individual’s performance in different work related tasks or situations. They measure potential rather than just academic performance, and are frequently used by employers as indicators of how people will perform in a work setting. Ability tests provide valuable insight in to a candidate’s ability to process information whilst working within a time limit. They are a good predictor of job performance and when used alongside other psychometrics, such as personality questionnaires, provide a well-rounded picture of an individual in the workplace. Numerical reasoning ability tests assess an individual’s ability to manipulate and understand numerical data. Candidates use number-based reference material to answer multiple choice questions involving basic arithmetic, averages, percentages and ratios. Numerical ability tests are timed and candidates are able to use a calculator throughout. Verbal reasoning ability tests assess an individual’s ability to understand, analyse and interpret written information. Verbal reasoning ability test takers are usually presented with a paragraph of text about a given topic, and then must decide if a series of statements are true, false or cannot say by evaluating the information provided in a given time limit. Checking ability tests allow recruiters to assesses a candidate's aptitude for attention to detail and spotting errors in written information both quickly and accurately under timed conditions. Checking ability test questions adopt a 5-option multiple choice format, which requires test takers to corroborate 2 pieces of reference materials and identify any errors. Abstract, inductive or diagrammatic reasoning tests measure an individual’s general intellect and ability to work with new concepts or ideas. Abstract reasoning ability tests are non-verbal and adopt a multiple choice format under timed conditions. Respondents of an Abstract Ability Test will be presented a series of shapes or patterns and must predict what comes next. Criterion sets new standards for testing. We offer three levels of assessment; high, mid and blue collar, each containing a range of rigorous and cost-effective tests. All of our assessments are available online on our Psycruit platform or in the more traditional paper and pencil format. Our tests can mixed and matched to tap into those skills critical to your organisation and you don’t have to have test user training to administer them online. 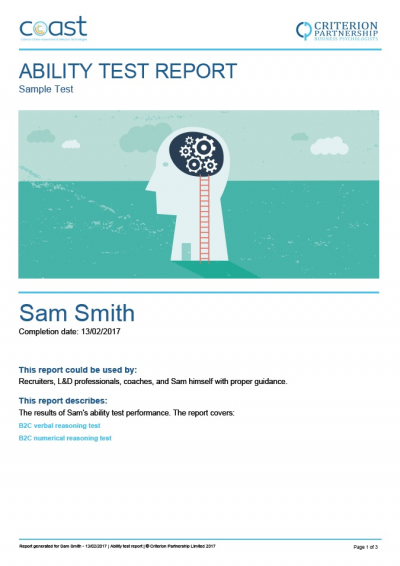 Our ability test report provides you with a comprehensive overview of your candidate’s performance on one or more ability test. The report contains an overview of tests taken, including what they assess, how they are scored and guidelines on how to use the report; how to get the most out of it and appropriate interpretation of the results. Test results are then explored in more detail and are linked to what their scores may suggest in terms of how effectively the candidate may deal with the demands of a role requiring those abilities measured by the assessment. Psycruit has a verification feature. If you want to check a candidate’s performance, you can ask them to complete a short follow-up test to check their ability on a particular assessment. The report will incorporate and analyse the results of the verification test alongside the candidate’s original test results so you can make a well informed decision on your candidate’s ability. Adjustable scoring, giving you choice over how your candidates’ results are displayed. Pick from Stens, T-scores or percentiles. Traffic light scoring using red, amber, green (RAG) to indicate overall performance.